It’s funny you know. When you’re angry at God, you act like the little kid who shouts, “You’re not my daddy any more!” and tries desperately to make daddy go away, even though daddy can never stop being daddy. The trouble is that as an adult you should know better. You should know that you can’t just make God go away. But you pretend anyway, and it ties you up in knots. Not that I’d ever been particularly interested in God. He was good for childish prayers, but I’d outgrown that sort of thing a long time ago. However at this particular moment I was desperate for God and hated him at the same time. You see my little granddaughter, Amy, who was three months old, had been born with spina bifida, and I just couldn’t come to terms with it. If there is a God, I reasoned, why was he so unfair, so cruel? Why did he inflict such things on innocent babies? So there couldn’t be a God, at least not a loving one. But just the same I railed at this non existent God, desperate for an answer but sure it would not come. At the time I couldn’t see how illogical I was being. But there you are…..tragedy sometimes does that to people. Either that, or I had always felt that way but never been challenged to express it until now. My anger and distress plagued me. It was a situation that could never, as far as I was concerned, be resolved. But at the same time I longed for resolution. Then, at about two a.m. during yet another sleepless night, I switched on the light and picked up a book from my bedside table. When I opened it a feather fell out. I picked it up off the doona, trying to think how on earth it got there. Then I remembered that I had found it on one of my morning walks and brought it home, partly because it was pretty, and partly because I had recognised it as a breast feather from a galah, and let’s face it, galahs aren’t exactly a common sight in the city, except in cages. I had pressed it between the pages of a book, the one I was trying to read that night. I examined it closely. It was a very small pink feather, only about two centimetres long. I ran my fingers along it and felt its soft, light texture, and as I did, it brought back memories of growing up on a farm. It was my job as a child to go down to the chicken run in the early morning and let the chooks out to free range. Sometimes a noisy flock of galahs would fly low over the back yard and land in the paddock just over the fence to feed, so low that I could practically reach up and touch them. They positively glowed in the morning sun, all pink and grey and silver, and I never tired of watching them. Then there was the wonder of watching chicks hatch, or bottle feeding a new born lamb. And the stars…….! On clear frosty nights the Milky Way seemed close enough to touch….. something that I had forgotten now that I lived in the city. ‘Where did all that wonder go?’ I thought. Was it watching sheep and cattle being loaded in trucks to go off to slaughter? Or when my pet cat was hit by a car? Somehow or other that childlike wonder had been replaced by adult cynicism. I looked more closely at the feather. It was beautifully crafted. Each tendril fitted in perfect symmetry. 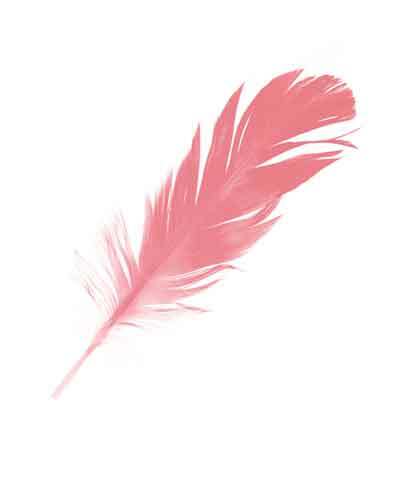 The white tuft at the bottom of the quill and the quill itself contrasted with the pink to accentuate the colour. Whoever designed it would have lavished a great deal of care, even love, in its making. This thought surprised me. Was I possibly thinking about God? A loving God? And what did that have to do with my beautiful Amy? Beautiful… that was the key word! Could this God who lavished so much love on crafting a tiny feather have poured out that love on Amy? Did her disability, her flaw, make her any less beautiful in his eyes? And what about my eyes? If I hated that part of her, was I only loving the parts I found acceptable? It was a sobering thought, one that would occupy my mind for quite a while. bible, and I flicked through, it looking for….well….I didn’t really know what I was looking for. But then a couple of verses leapt out at me. babies, and especially for my precious Amy, who, if it was at all possible, I could now love even more.